The Nelson Mandela Bay festive period will kick off with a bang on Sunday when SPAR Summer Nathi unveils the opening of the season carnival on the Port Elizabeth beachfront. Translated as “summer with us”, the Summer Nathi organisers have lined up a programme of high-quality entertainment involving international, national and local artists from Sunday to December 31. Besides the top musicians who will be performing, there will be Sunday’s street parade from Bayworld, an outdoor cinema and Christmas carols at Happy Valley, and a variety of picnics and parties at various venues in Mandela Bay. 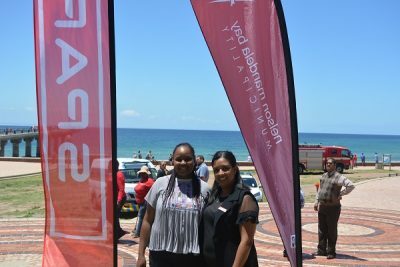 At the festival’s official media launch at the Hobie Beach Yacht Club on Monday, Nelson Mandela Bay executive major Mongameli Bobani said they were looking forward to “the biggest, best and most spectacular summer festival the city has ever had”. “This Summer Nathi, meaning you are with us, is one which caters for all sections of the community and we want to make sure everyone has a good time,” he said. “The municipality is fully behind the programme to boost our local economy and to make our city a preferred destination for holidaymakers. Kithi Ngesi, the NMB director of beaches, resorts and events management, said that previously over 400 000 people had visited the metro’s various beaches during the holiday period. “We are expecting the same sort of number this summer because we have beautiful beaches, three of which are blue-flag rated,” she said. “We have also put measures in place so that there are sufficient lifeguards to make sure everyone is safe. Looking ahead to the programme, Ngesi said there had already been the launch of the giant Christmas tree in the Bayworld parking lot, a national SPAR initiative which sees the construction move annually from region to region. “On Sunday we have the summer carnival parade from the Christmas tree to Hobie Beach, where there will be floats, traditional dancers, a brass band and various performers. “The picnic at Willow Dam in Uitenhage gained a lot of traction last year and that is something that is set to grow this time. The festivities will end with the traditional New Year’s eve parties at Wells Estate and Hobie Beach.